Okay! Time for an overview of my first time selling homemade stuff! 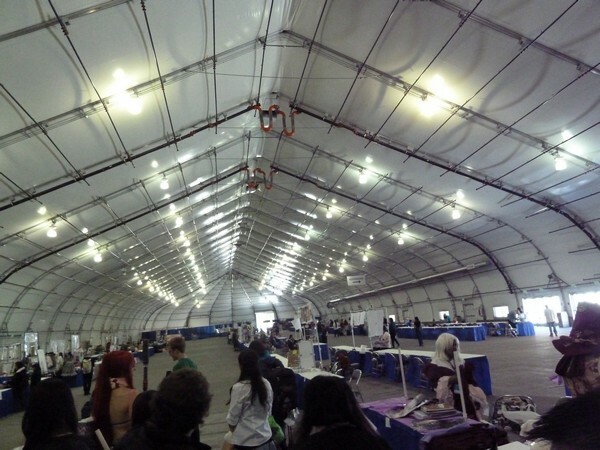 The South Hall, aka, big blue tent outside the con. Needs some more signs, eh? So Friend E and I priced our stuff pretty low. Partly because we're insecure, and partly because we're tired of seeing super expensive over-priced buttons. 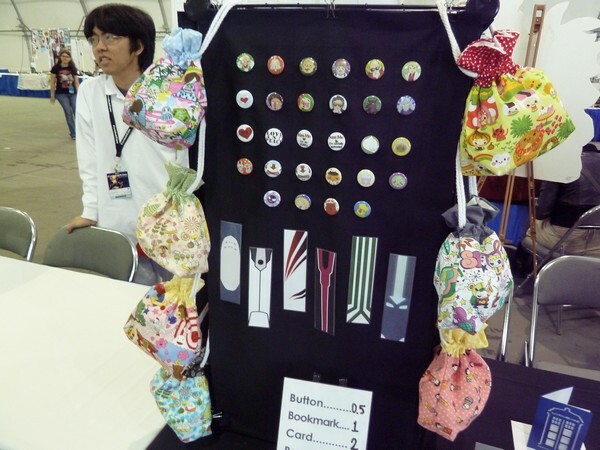 We sold buttons for 50 cents, laminated bookmarks for $1, silhouette-cut greeting cards for $2, and bags for $7 (later $5). On the last day we did some deals too, like 3 buttons for a dollar. After getting badges in the special line (1 hour wait vs. 5 hours my poor sister had to do in the regular pre-reg line), we trekked our wares to the South Hall to set up. Setting up at table 215! 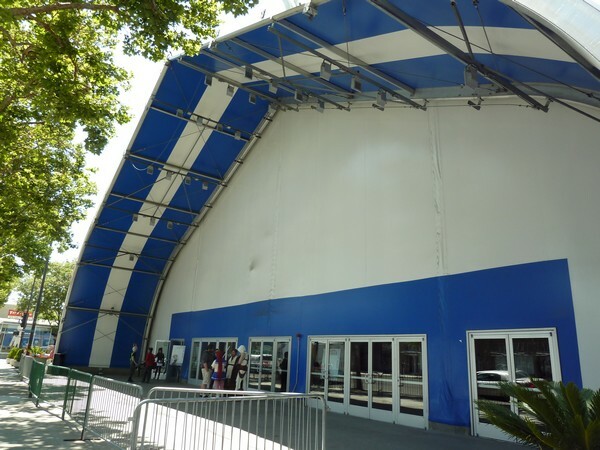 The big tent was HUGE. And very, very, long. Long hall is long. This is only half. We got really lucky, getting a nice table right in the middle and close to the bathrooms. 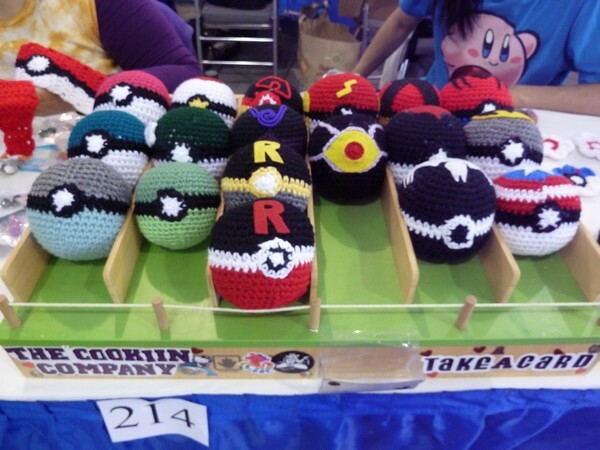 We also got to sit by our friends R & J, who were selling their popular crochet pokeballs. 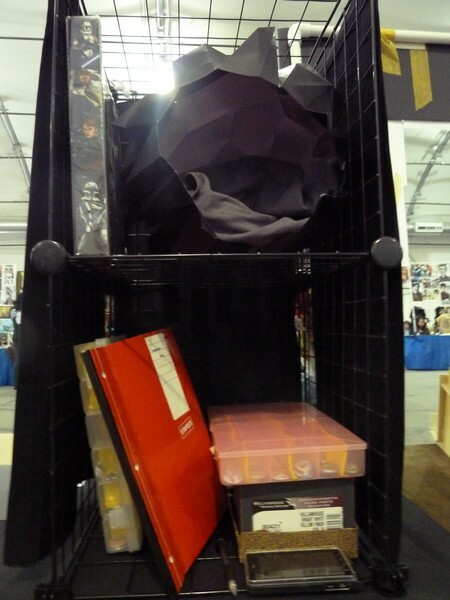 For set up, we put on a black tablecloth and two 2'x1' towers made from wire cube grids. We covered the towers with black fabric, and pinned buttons and bookmarks to the front. I put tissue paper in my bag designs and hooked them to the sides of the towers. In the middle of the table we laid out the cards and the rest of the bookmarks, held up by binder clips that Friend E took the handles off of. I used leftover wedding easels to hold our price signs, which were laminated so we could change the price with a dry-erase marker. Overall, I thought our set-up looked pretty nice for complete noobs! Now, as for what we brought with us - Friend E brought 5 of each bookmark design (a total of 26 designs or so), and I brought 3-4 of each button design (enough circles cut to make 20 of each, but I only put the button together if we ran out). 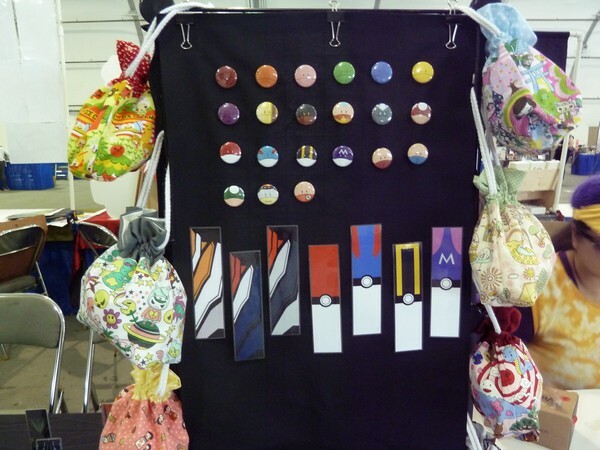 I had a total of 42 bags, with 7 different fabric designs. And about 20 of each card design. Our material costs totaled about $300. 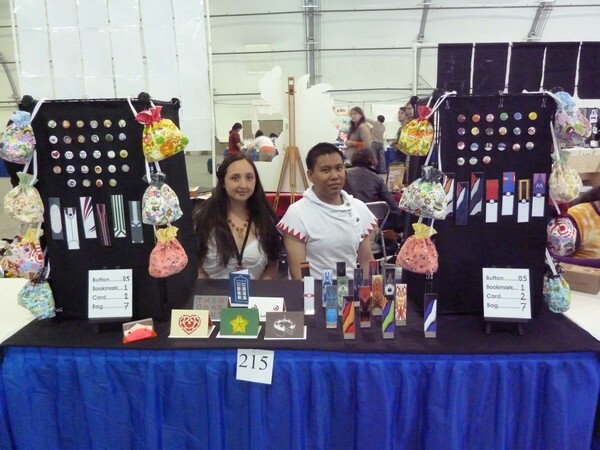 And our total sales at the end of the weekend totaled $337.50. Back of the cube tower was perfect for storage! I'm happy we broke even, but we didn't do as well as I thought we would. Why is that? Sadly, I think it's because I'm too old. @_@ I feel like I was off in guessing the desires of the market. The majority of attendees are probably highschool age, not nearing 30. I should have consulted with my sister more I guess! We had someone come up and look at cards, only to move on because she didn't know what she'd do with it. While holding a handful of printed artwork. I'd think a greeting card had at least as much use as a 4x6" print! But then I thought about it - did I use greeting cards in highschool? Or even college? I used stationery with penpals but never really cards. I didn't find value in cards until..marriage. Target audience fail! Haha. 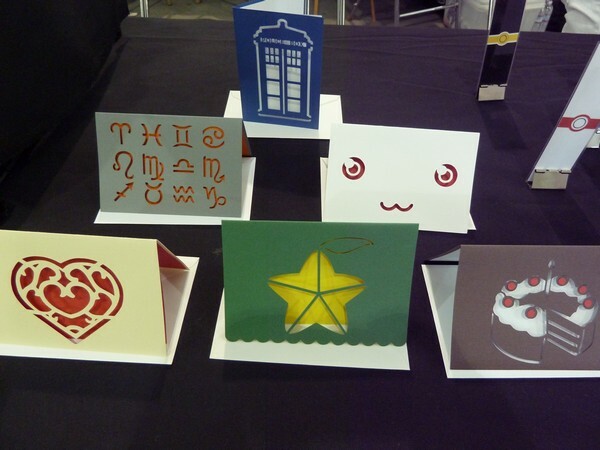 On the bright side though, the Tardis cards did sell out! The other thing I misjudged were the bags. I thought - cute bag, cheap price, it'd sell out for sure, right? Nope. 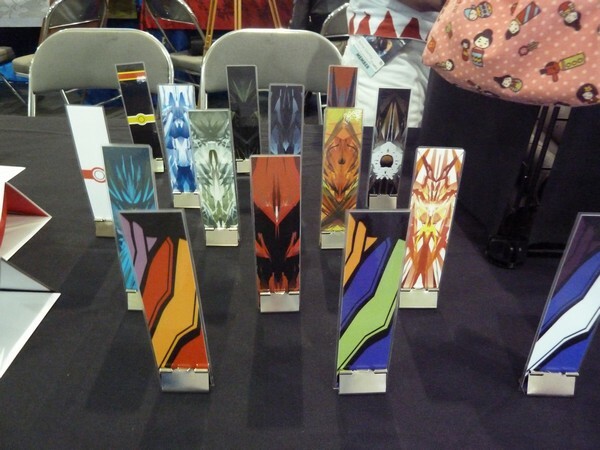 I think when most people come to Artist Alley, they are looking for their favorite characters. Though my prints are cute and exclusive to Hawaii, they are generically cute. They don't have Naruto or Ichigo or Sherlock on them. 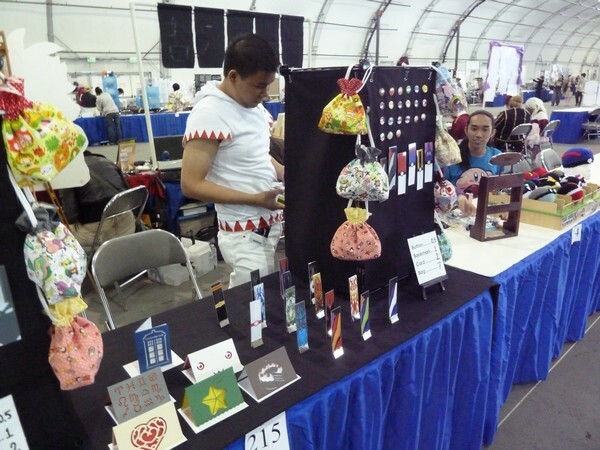 I think maybe they'd have done better at a regular craft fair. It's a bummer since sewing all of those took the majority of my pre-con prep time! Inko-chan, the mentally challenged parrot from Toradora. In the end, I'm glad we had the experience. I'm very grateful to all patrons of our small shop - thank you, thank you, thank you! Friend E and I are splitting the $337.50 and donating it to charity. My half is going to City Impact, a homeless ministry in San Francisco. 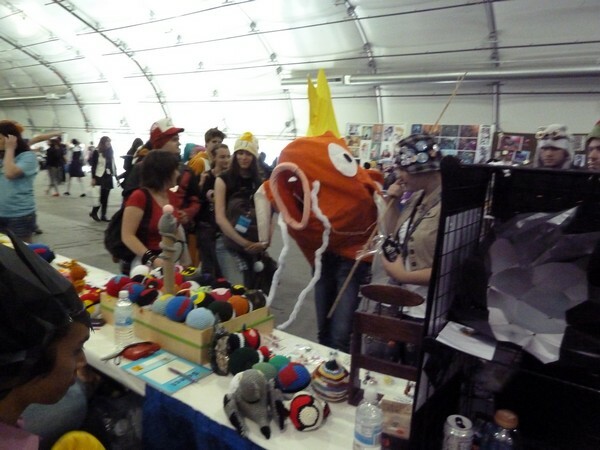 That all said though, I don't know if I'd do Artist Alley again. 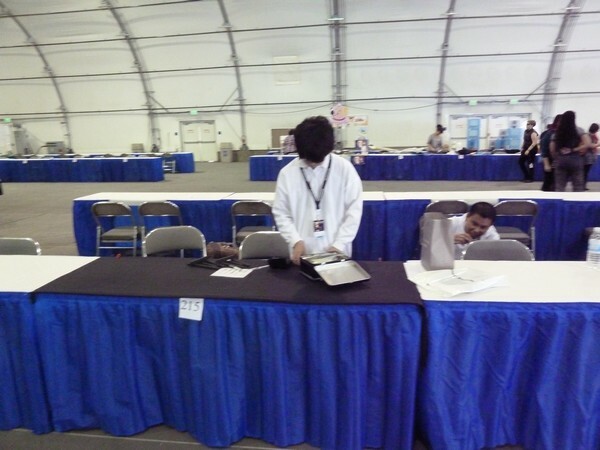 I was very nervous the whole time, and we couldn't do a lot of regular convention activities since we were busy manning the table. But I'm happy we tried it! Next year I'd like to try something else new too - like a panel, or an AMV submission! Yes! Sell on Etsy and give me a link! 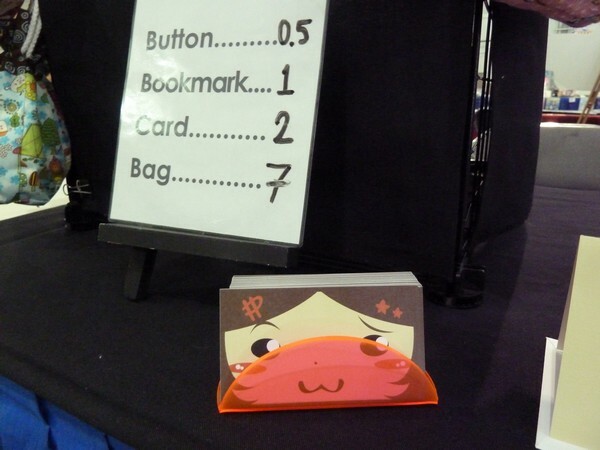 I would pay way more than $7 for those adorable bags! I did something similar with a close friend and we broke even as well - best case scenario for your first time! You're not too old, everyone else is just too lame. ;-) Kudos on donating your money to charity. PLEASE post here your merch or Etsy!! I want a closer look at those bags and I def use cards. But I'm old, I guess. hahaha. Everything was super cute and the set up looked great! i'm so impressed by your foray into sales--sounds like you guys did a great job and learned a lot. even if you don't do it again, it's an experience and your really put yourself out there, right? go penga!